On Thursday morning, the House approved an amendment barring federal contractors from discriminating against employees on the basis of sexual orientation or gender identity. And then, a few minutes later, it didn’t. After the chair closed the vote, Democrats continued shouting in anger. “There will be order in this chamber,” the chair said. “No there will not be!” yelled Rep. Gwen Moore (D-Wis.), who stood at the base of the podium. She pounded her fists on the table in front of her. Other Democrats chanted, “Shame! Shame! Shame!” Their outrage was over matters both substantive and procedural: Once the vote clock expires, the lawmaker holding the gavel is supposed to ask if any members wish to change their votes. Then, flip-floppers are expected to walk to the front of the room and switch their allegiance in person, rather than using the electronic voting machines. But on Thursday, this formality wasn’t observed – instead, the expiration of the clock was simply ignored, as House Majority Leader Kevin McCarthy and his deputies twisted the arms of gay-friendly Republicans until the amendment was defeated. It’s a classic case of mutually valid but irreconcilable values: Democrats want to protect gay peoples’ right to equal treatment in the workplace; Republicans want to protect the right of arms merchants to discriminate against gay people without risking the loss of taxpayer money. The procedural chaos was, in part, a result of norms established under Ryan’s Speakership. As a friendly gesture to his caucus’s tea-party hardliners, Ryan opened up the amendment process, allowing lawmakers wide latitude to offer last-minute changes to legislation – like, for example, anodyne assertions of LGBT rights that some Republicans can momentarily forget they oppose. Separately, Ryan promised a return to “regular order,” which heightened Democrats’ anger over Thursday’s haphazard voting process. And, of course, Ryan has vowed to uphold the Hastert Rule, which stipulates that a Republican Speaker will never allow a floor vote on legislation that lacks the majority support of the GOP caucus. 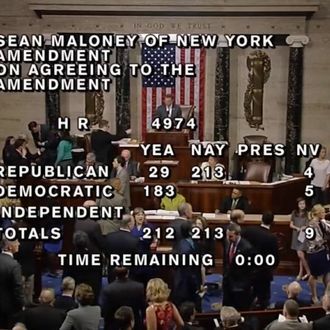 This last norm was likely the impetus for Thursday’s last-minute arm-twisting: The amendment briefly enjoyed the support of a majority of all House members, but not a majority of all Republicans. Thus, if it passed, the whole appropriations bill may have become untenable. Still, Obama’s executive order remains on the books. So it’s not clear what impact Thursday’s vote will have in the real world – other than to boost fundraising for pro-LGBT Democrats. “They literally snatched discrimination from the jaws of equality,” Congressman Maloney lamented to the Associated Press. Let’s hope that this November, equality bites back.